Packed inside this sleek, high-end design is a super telephoto NIKKOR zoom lens and serious photo and video power: versatile low-light capabilities, rock-steady image and video stabilization, 4K Ultra HD recording, P/S/A/M control, RAW shooting, creative modes and filters, a tilting touchscreen and even an ultra-sharp electronic viewfinder for composing like a pro. It connects to the SnapBridge 2.5 app for instant sharing and remote control, and it handles like a dream. For those who want an all-in-one camera that can do it all, the COOLPIX A1000 delivers. 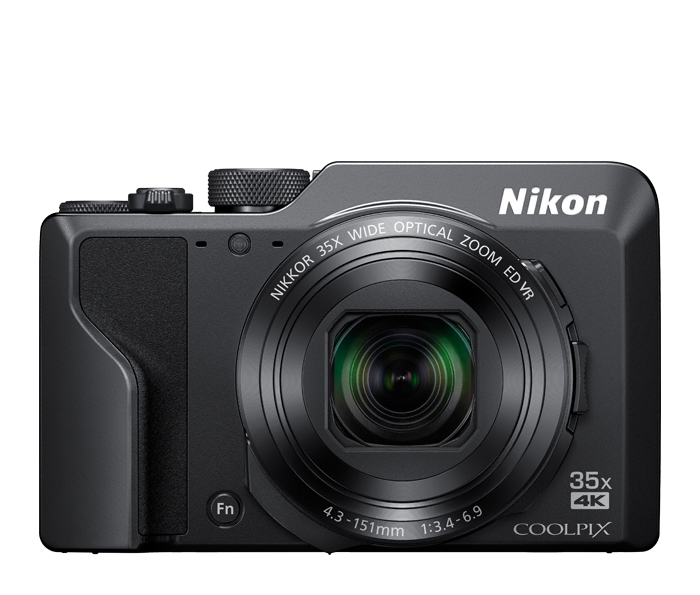 The COOLPIX A1000 is compact and lightweight—perfect for a pocket or purse. Start zooming, and its superb 35x optical zoom NIKKOR lens begins to extend, taking you from wide-angle vistas to flattering portraits, all the way to super telephoto close-ups (840mm equivalent view). In the rare cases when you need to get closer, Dynamic Fine Zoom doubles that reach for a whopping 1,680mm equivalent view. Turn on Macro Mode and get as close as approx. 0.4 in. from your subject to reveal the smallest details. A backside-illuminated image sensor gathers maximum light, so you can take sharper photos in dark situations. That performance is enhanced by a wide ISO range—from ISO 100 to 6400—and its high-performance NIKKOR lens. Capture high-quality images with the optimal balance between high resolution and less noise at high sensitivities, even in dimly lit environments. In addition, the VR (Vibration Reduction) function that provides an effect equivalent to a shutter speed 3.0 stops faster (based on CIPA Standards) contributes to reproducing sharp, crisp images even without a tripod. Record 4K Ultra HD (3840 x 2160) videos with full stereo sound—quality that will amaze your friends and family. You can also shoot Full HD 1080/60p movies for smooth recording. In movie recording, Hybrid VR combines optical and electronic VR to keep your videos sharp and steady, especially during hand-held telephoto shooting. Frames from movies recorded in 4K UHD format can also be saved as still images* to preserve precious moments that cannot be captured with continuous still shooting. Note: Full HD refers to this camera’s ability to record movies in 1920 x 1080 format. *Images are saved in "Normal" image quality. Nikon's Active D-Lighting brings out the details in highlights and shadows, which can often be lost. It's particularly effective when shooting heavily backlit subjects or in situations with direct sunlight. Images can be captured just the way you see them, and video footage can be utilized with no further color grading. The COOLPIX A1000 can capture uncompressed RAW (NRW) images. Preserve all the data from its image sensor and then create your ideal look using Nikon’s free ViewNX-i and Capture NX-D software without lowering image quality. Select from five preset Creative Modes and check out how they look with four different effects applied. You have a choice of 20 image options in total. A great way to capture dramatic nightscapes is with the Multiple Exposure Lighten function, which compares multiple images taken using interval timer photography then automatically composites the brightest parts to express light paths. The command dial lets you quickly access four exposure modes (P/S/A/M) and other manual settings for personal control that full auto cannot provide. Cut through bright outdoor light with a 1166k-dot electronic viewfinder. Simply put the camera to your eye, and it will automatically switch the display from the touchscreen to the EVF. Shoot from interesting angles with the 3-inch, approx. 1036k-dot tilting LCD display with anti-reflection coating. Touch to focus, shoot and navigate menus. Swipe through your shots and pinch to zoom. At super telephoto distances, you can sometimes lose sight of your subject. If this happens, just press the Snap-back zoom button to quickly zoom out so you can reacquire your subject. Or customize this button to activate manual focus, aperture, ISO sensitivity, exposure compensation or white balance. The COOLPIX A1000 has quick start-up, shortened time lag, and responsive autofocus to get your subject clearly focused without having to wait. When a unique opportunity comes your way, capturing the moment is only a split-second away. The simple yet sophisticated exterior design helps embody the essence of a high-end Nikon camera. Clear, bold shapes unite to project an overall impression of high quality and superior functions, including a new grip designed to comfortably fit in the hands. Metallic materials are employed for the front of the lens barrel and side of the body, resulting in a camera you’ll be proud to show off to your friends. Install Nikon's SnapBridge 2.5 app on a compatible smartphone or tablet and unlock exciting new capabilities with the COOLPIX A1000. Built-in Wi-Fi® and Bluetooth® Low Energy (BLE) maintain a constant connection between the app and your camera, so each shot you take automatically transfers to your smartphone or tablet for sharing, editing with photo apps or uploading to your favorite sites. You can even use the SnapBridge app to control your camera remotely.